If you are under 30, this is an entirely different style of haunting that needs to be experienced. Don’t let this opportunity pass you by! These are dedicated, passionate volunteers who deliver a classic old-school experience. And if you are over 30, hooray! This is a blast from the past, and we want to help keep it around for decades to come. Please support this amazing effort, for which our industry might not be here without! For full official review CLICK HERE! 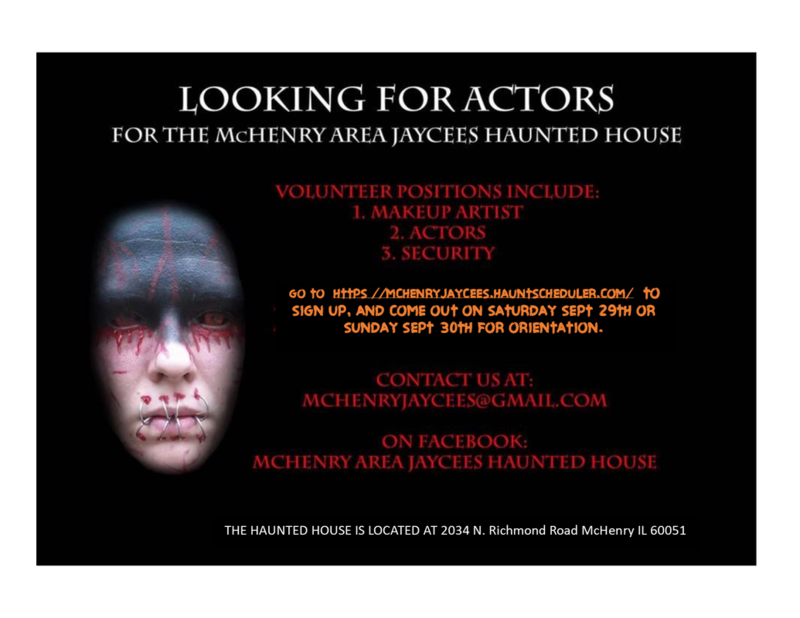 The McHenry Area Jaycee's Haunted House has been running since 1985, AND WE ARE THE LAST JAYCEE HAUNT IN ILLINOIS! We are located in the McHenry Commons Shopping Center. Our monsters are eager to come out and play. Make no mistakes, this year things aren't always what they seem. The twists and turns of the haunt are waiting to be explored, possibly keeping victims to play with our unwanted creatures! Join us this year where we bring back some of our favorite rooms from years prior, along with some of our favorites, and possibly your favorite characters! same prices, same times, difference is the lights will be off so all the light you have is from the outside or the illumination device we give you! Can you find your way through the twists and turns without getting lost? FIND OUT! WANT TO SCARE YOUR FRIENDS? CLICK HERE! SPONSORS THAT HELP BRING BACK THE HAUNTED HOUSE THIS YEAR! we look forward to scaring you this Halloween season. GoFundMe protects your generous contributions with GoFundMe Guarantee. Their team of specialists work night and day to make sure that funds get to the intended recipient, every time. If funds aren’t delivered to the right person, they will donate the missing amount.